Catch a glimpse of the lucrative industry of modest wear, which includes hijabs and abayas. KBCS’s Yuko Kodama spoke with Boutique Al Firdaws Owner, Chema Oh. 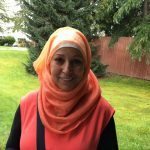 Her boutique is in the Muslim Association of Puget Sound mosque in Redmond.